Winfarthing postmill stood well to the south of the village and was on the east side of the Shelfanger Road, almost in Shelfanger. In 1871, the mill was dismantled. The sails and winding tackle were sold and the mill buck was moved to Bressingham by Herbert Burroughes, where he installed it beside his smockmill and used it as a steam mill. The mill buck can be clearly seen to the right of the smockmill. For Sale very Cheap, several Parts of a Small Post Windmill (just taken down) comprising 4 patent sails, one mill post, self acting wind tackling complete, capital head wheel and several pieces of well seasoned timber etc. Apply to Mr. W. Woodrow, Miller, Winfarthing, where the things can be seen. In 1871, the mill was dismantled. 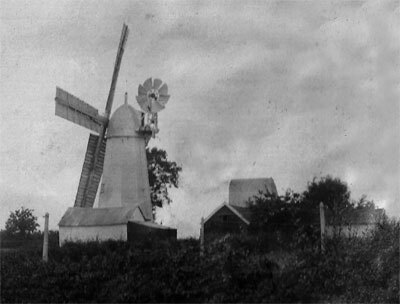 The sails and winding tackle were sold and the mill buck was moved to Bressingham by Herbert Burroughes, where he installed it beside his smockmill and used it as a steam mill.